Advanced Innovative Engineering (AIE), UK Ltd. has chosen HFE International of Tucson, AZ as an engine sales & services provider for its range of advanced rotary propulsion systems, further extending the reach and after-sales support in North America for Lichfield, UK-based developer of unrivalled high power-to-weight ratio, Wankel rotary engines for unmanned systems. Combining AIE’s know-how in rotary combustion engine design & development with HFE International’s experience in systems integration and providing custom solutions for clients globally, the agreement leverages both companies’ capabilities to offer the highest level of quality and service in order to meet the increasing demand from customers for specific and highly-optimised solutions. “We realised immediately that collaboration with HFE International would have a positive impact on the level of supportability offered to end-users deploying platforms with an AIE engine, and provides both an added-value sales channel for our propulsion systems and an array of enhanced services for our US customers”, explains Nathan Bailey, AIE managing director. “Our agreement with HFE forms a logical win-win situation for both AIE & HFE, and for our customers”, adds Bailey. AIE and HFE International provide a wealth of combined experience in propulsion systems development and integration, to be applied towards powering a new generation of surveillance unmanned aerial vehicles (UAV’s), including a growing number of requirements for distributed hybrid-electric power for multi-rotor and VTOL platforms worldwide. “Partnering with AIE will give us the ability to offer an added engine range to customers with requirements for multi-fuel engines that offer high power density, versatility, and ease of maintenance”, remarks Tom West, CEO of HFE International. 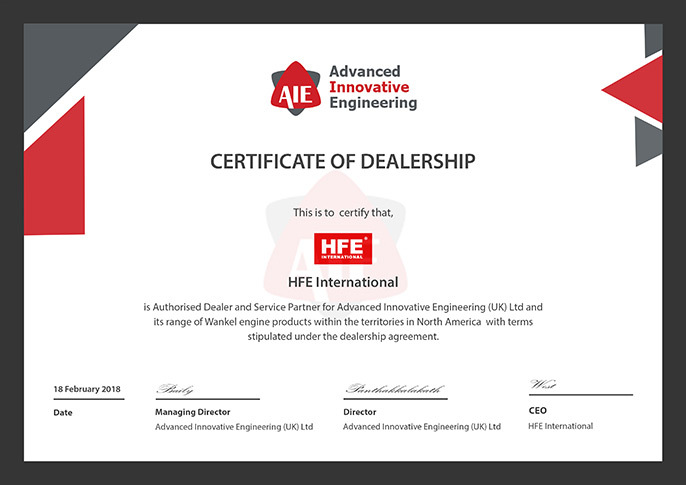 “Since early on, HFE International and AIE have been aligned in their market approach and offer complementary products & services in advanced propulsion systems. AIE’s depth of expertise in rotary engines allows us to work with a world-leading authority in their class, adding value and breadth to our portfolio of propulsion solutions for customers in the US and worldwide,” comments West. The new agreement builds on a track record of delivering high-end, heavy fuel propulsion solutions into a variety of installations, from fixed-wing and rotary-wing aerial vehicles, to marine and land-based systems, to compact generators, with the aim of providing greater performance and operational service life in a more cost-effective end-product. AIE engines will be on display at Booth #2117 at AUVSI Xponential 2018, May 1-3, in Denver, Colorado. HFE International is an ISO 9001:2015 registered U.S. company that provides propulsion system integration to a wide variety of aircraft platforms including rotor craft, fixed wing and hybrid platforms around the world. HFE International has a suite of engine labs that include a gasoline engine capable wind tunnel, 8 x 8 ft thermal chamber, and two engine dyno facilities. Highly qualified personnel include Electrical and Mechanical Engineers, as well as technicians certified to IPC-610, IPC-620 electronics standards, and FAA airframe and power plant (A&P) maintenance.